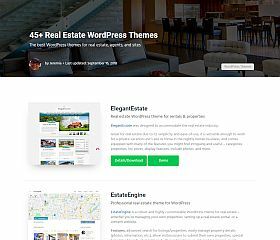 If you’re looking for a more full-featured solution than just a standalone plugin for WordPress, you might want to check out this hand-picked collection of real estate themes for WordPress. ElegantEstate (although it’s not a plugin) I wanted to at least mention this in the roundup as I feel that it offers superior affordability and functionality for the price. In addition to the theme, you also receive access to 85+ other themes when you join Elegant Themes. WP Real Estate is a powerful and robust free WordPress plugin. Transform any website and any theme into a full-featured real estate website – complete with property listings, agent listings, the availability to find nearby listings, grid/list views, advanced search filters and functionality, and dozens of other features that you would typically only find in premium WordPress plugins. Real Estate is one of the most tested and robust WordPress plugins for real estate that you will come across. It allows you to create individual property listings, custom searches and filters (so visitors can find the listings that meet their needs), allows guests or others to submit properties if you choose to allow them to, includes custom widgets, and is integrated/compatible with IDX/MLS systems. WP Amortization Calculator is a WordPress plugin that offers your website’s visitors a useful tool for calculating numbers, capturing information, and more! Whether you’re in the real estate, automotive, or finance business – this plugin is very appealing and will give your visitors a reason to come back to your site. This handy little tool sits in your sidebar and can calculate loans and mortgages for your site’s visitors, which is extremely helpful if you’re in the real estate field. The advanced functionality of the mortgage calculator can display rate tables, charts, and variables that will help your visitors find out how much their monthly payment will be. Mapo is a WordPress plugin that can be used for listing any type of item you might want to display on a map (restaurants, schools, houses, etc. ), and is suited particularly well for the real estate industry. Real Estate Pro is perfect for those who want to add property listing functionality to their existing site, this powerful and flexible plugin is highly customizable to suit your needs. If you use StudioPress’ Genesis framework (or even if you don’t) and you’re in the real estate industry, you will love this simple and easy-to-use listings plugin that uses custom post types and taxonomies to create a full-featured listings management solution for your site. It’s a great choice for those looking to add listing functionality into their existing site(s) – and works particularly well with the real estate themes for Genesis. As you can see, there are a handful of add-ons and plugins for the real estate industry that will help you add functionality and features to your site. While several of these are quite advanced, my recommendation would be to go with a theme specifically-designed for real estate – as there are now plenty of options that offer very advanced functions, features, and ease-of-use (and will make the entire process of setting up and running your site easier than ever before). Even with the standard setup, you can create a very powerful real estate site or blog using WordPress. However, you can take your site to a new level with some of the great plugins that have been specifically designed for real estate professionals. From listings management to enhanced functionality these WordPress plugins for real estate can help you really do some cool and useful things to your site. The real estate field is particularly fragmented, so with this roundup – I’ve tried to only highlight what others believe are some of the best options available and tried to steer away from those which require utilizing a third-party’s services in order work properly. If you’ve ever searched for real estate plugins in the official WordPress directory, you will find that the overwhelming majority are very buggy and have very low ratings – so I wanted to try and filter through some of the noise to only bring you some of the best choices. I do want to also note that there are several high-quality real estate themes for WordPress available that have much of the functionality and features you might need for your site. 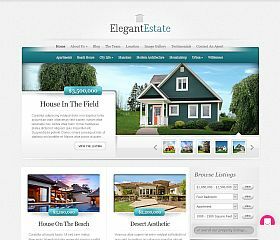 Most notably, Elegant Themes’ Elegant Estate theme which was designed exclusively for real estate sites and blogs. It not only offers some great functionality for real estate, but has built-in SEO tweaks and other features that minimize your need for additional plugins. Please Note: There are many plugins available (and be aware that I haven’t tried all of these) but you can play around with them a bit to get a feel for how they work.